What’s happening with Toronto Real Estate? | Comments Off on What’s happening with Toronto Real Estate? Edit: The Bank of Canada just announced a rise in interest rates. We have touched on that at the bottom of this post. The Toronto real estate market has been a hot topic in the news throughout 2017 but now it’s for a different reason. Current stories are not about crazy 42 person bidding wars or homes selling for 50% over their list price. Right now, the market is experiencing a slide, with prices dropping – and people don’t know what to think of it, or how to react. We are hear to tell you what has happened, why it has happened and what we think is going to happen in the near future. Fall 2016: Going back to September 2016, the average price of a home in Toronto sat at $755,755 – up 20.5% from one year earlier. This alarmed us. We like to see year-over-year (YOY) price growth in the 5-10% range. We are happy when it breaks into the teens, but know that growth above 10% is sustainable over the long run. Prices then rose 1% in October and another 1.8% in November – when the average price was $776,684. As they do almost every year, prices fell in December. Early 2017: January took off stronger than most January’s, with the average price returning to prior holiday levels, at $770, 743. We have been open supporters of buying homes in January, because of the yearly uptick into February. Usually, prices jump 11-12% from January to February, so buying in January is a smart decision. But, this year, that trend was turbocharged – with the average price in Toronto jumping 19% ($105,000) from January to February. Spring Market: With prices at insane levels, March’s average price broke $900k for the first time ever ($916,597). More newsworthy was the fact that prices were now up 33.2% YOY! This is when people started to catch on and our phones started to ring. We were slammed with requests for Home Evaluations by homeowners who were thinking of cashing out of the market. One such example was this home at 42 Fairmount Cres – where, on April 10th, four buyers submitted offers and we were able to secure a sale at +30% over list. And they weren’t the only ones thinking it was time to sell. According to the Toronto Real Estate Board, there were 33% more properties listed for sale in April 2017 than in April 2016. April 20, 2017: Ontario announces the Fair Housing Plan – a 16 point approach aimed at cooling Toronto’s hot real estate market. Here is a link to the Ministry of Finance’s release. Most of us in the industry felt there would be little impact on the markets we were trading in. After all, our business tends to be focused in Old Toronto neighbourhoods which are largely family occupied and which saw little of the foreign investment that occurred in Vancouver and was occurring in pockets of Toronto. News Flash: Perception is often more important than reality. Buyers were looking for a reason to mobilize and slow the market down. You could find them colluding, in the comments sections of blogs, that if they only all stopped buying, it would turn the tables on the greedy sellers. Well, this government announcement gave them a reason to pause. April 25, 2017: Home Capital Group is the largest B Lender in Canada. B Lenders are organizations that lend money for home mortgages, outside of the Big 5 Canadian Banks. They fill a void in the marketplace by lending to individuals that the Canadian Banks don’t want to lend to. Think of flippers, the self-employed, new Canadians with limited credit history, etc. In 2016, a small group of mortgage brokers were caught falsifying their clients’ income on applications. Home Capital Group severed ties with these brokers, but in April 2017, the Ontario Securities Commission accused the company of misleading investors for failing to disclose the impact of the investigations. Organizations like Home Capital Group raise funds to lend to people by selling GICs and offering High Interest Savings Accounts. When news broke, investors began pulling the money they had invested in the High Interest Savings Accounts. This caused Home Capital Group’s stock to drop 65% in one day. They had to secure an extremely expensive emergency loan to stay afloat. All the nitty gritty can be found in some great articles on the web. What is important is that many people paralleled what was happening with Home Capital with the financial collapse in the United States. That was far from the truth, but it stirred up fear. April 20 – May 1: It wasn’t immediate, but with more homes on the market and two BIG stories being dragged through the media circuit, buyers began to cool their jets. We began to see that not every house was selling on its bidding night. This home at 64 Lawlor Ave sold on April 24th, with 4 offers and for 40% over its list price – but that was the last of the great success stories of the Spring 2017 sales frenzy. The next day, we listed this home at 592 Willard Ave, in Bloor West Village, for sale. Granted it was really a 1 bedroom home, and we knew it had a limited market, we saw something like 5 showings the entire first week and it did not sell on offer night. We called all the agents selling homes in the area and they were seeing the same slowdown in traffic, although more traditional 3 bedroom homes were still selling. Ten days later, we sold that home for a price acceptable to the seller, but taking 2.5 weeks to sell a home was nearly unheard of – that was about to change. Early May: As noted above, the market was cooling and homes that weren’t perfect were hit first. 1 Bedroom bungalows, homes without parking, homes that were too nice for flippers but not nice enough for most families to move into, homes on or near busy streets – in the prior market they would have sold in bidding wars regardless of their drawbacks. These homes were now sitting on the market. Great homes were selling, but with less frenzy. Sometimes with 2-3 buyers (instead of 10), and sometimes a few days after offer night had come and gone, and for prices that, as agents, we thought looked really reasonable. By the mid-way point in May, BNN released an article stating that the average house price in Toronto had DROPPED 3% from April! Now, our business has seasonal trends. Every year, prices fall through July & August as well as December & January, but May is prime selling season. A drop in prices in May was unheard of. The speed at which the market turned caught sellers off guard and the ones hit the worst were those that had purchased a home only weeks prior. They participated in the frenzy and expected the same for their home. We had one property, a condo townhouse at 39 Sudbury St that was caught in that situation. We even got to the point where the seller was considering backing out of the purchase of their new home, but we worked hard and sold their property the old-fashioned way – by networking. Yes, both this property and the bungalow in BWV, mentioned above, were not sold by MLS. They were sold by agents that we know and have relationships with. We picked up the phone (actually, it was social media messages) and connected with great agents suggesting they should take clients through these properties. Late May: The market had really slowed down and some segments of the market were hit worse than others. York, for example, was one of those areas that had benefited from the influx of foreign investment after Vancouver implemented a foreign buyer tax. So, while it spiked the highest, it began to fall the farthest. On May 23, we listed this home at 18 Eddy Green Court for sale, in Thornhill. We had been speaking with the clients earlier in the Spring and it appeared the trend in their neighbourhood was to list at $999k – $1.099m and expect to get high $1.3s and maybe even break $1.4m. But, in the weeks leading up to listing their home, we witnessed a flood of new listings that tried that strategy and they all backfired. They didn’t receive offers and instead relisted their homes at a higher price. Realizing that strategy wasn’t going to work, we listed in the low $1.3s, recognizing that we weren’t going to hit $1.4m in the new market. Two weeks after listing, it was reported that the average Toronto house price fell 6.2% from April to May. June, 2017: With that recent announcement, showings on listings ground to a near halt. While we would have expected 20 showings in the first week, we would see 3-5. Interestingly, buyers were still out looking but they were coming to Open Houses instead of booking showings – taking a more casual approach to shopping. This is where, as active Realtors, we have our finger on the pulse of the market. Buyers were both scared and confused. They were scared because no one wants to buy a home to find out that the price has fallen $100,000 from when you bought it. They were confused because they didn’t know what houses were worth. We had a couple looking to buy their first home downtown and they made offers on a few properties. While they were willing to jump into the market, they wanted to do so with the current conditions in mind. We were evaluating the homes conservatively and making our offers accordingly – they were not insanely low offers, but they were realistic. The challenge; the sellers would refuse the offers and relist at higher prices. See, sellers are the last people to adjust to a falling market. They want to hold onto the prices they saw their neighbours getting only 2 months earlier. Smart sellers, like our clients in Thornhill, mentioned above, reacted to the market. They reduced the price of their home to a level that would attract a serious buyer and they sold. Toronto house prices closed June with another drop – 8.2% lower than May. That’s a drop of nearly 15% in only 2 months! Into the future and beyond: None of us know the future. That said, from years of experience, here is our take on how this will shake out (and Geoffrey has already placed a few bets with fellow agents)… With the recent announcement that prices fell for a 2nd month, and we are now nearly 15% down from April, buyers will split into two camps: those who are afraid and want to wait until they see the market rebound and those who are playing the long game and are willing to buy in at today’s discount, even if prices will drop a bit further. July & August are seasonally slow months, where prices routinely fall, so combining that with what is happening in the market, we expect that negative price growth will occur all Summer. But, there is a seasonal trend whereby September’s average price is usually 5% higher than August. If that rings true this year, even at a lower rate of 1-2%, that will signal to the buyers who were nervous and they will re-enter the market. September figures will be released the first week of October, so expect to see a stronger October & November. While we expect the market to stabilize in the Fall, we anticipate the price growth will return to more moderate levels. The wildcard remains interest rates. With the Bank of Canada set to begin raising rates, how buyers will react to even moderate increases to historically low rates is the unknown. The market is still up. While the average price fell 8.2% from May to June, the average price ($793,915) is still 6% higher than it was last June and it is still higher than it was in January. The gains from February onward have been erased, but those were paper gains and only realized if you sold then. Likely, there is probably a good reason you weren’t selling then. That said, it’s not the time to be greedy. Prices likely may continue to fall. If that’s the case, the sellers that stick to an unrealistic price end up sitting on the market and riding the elevator to the bottom. Over the last few years, our key to success in helping clients purchase their dream home was to slightly overpay. Yes, that’s what it took to get a great home in Toronto. But, if you paid 3-5% too much, your home would be worth what you paid before you even got the keys and all the other buyers would spend months wasting their time, chasing home after home, to only end up paying more than what our clients did. The tables have turned. As a seller in this market, you need to be willing to entice buyers. Buyers are still out there, but they want to see blood in the water. Using the home in Thornhill as an example, they were willing to accept $15k less than they really wanted to sell the house for because they recognized they had a serious buyer and if they held out and that buyer found another home, they could be looking at accepting a lot less in a month. If the prices fall another 5%, that would have sold for $45k less. Don’t throw on your Crocs and jogging pants. Just because prices are down and you most likely won’t attract bidding, it’s no time to throw in the towel of preparing your home properly for market. Now, even more than when the market was hot, going through your home, addressing any issues before listing and staging your home beautifully is extremely important. With more homes to compete against and a smaller pool of picky buyers, you need your home to stand out! Consider selling before you buy. This is the exact opposite of what we have been advising most clients for the last decade, and still may not be the best choice for each individual, but it’s reality for many. Being stuck with a home that isn’t sold, as the closing of your new property approaches is a horrible feeling and now, more than ever, it’s a potential reality. Talk with your sales professional to determine the pros/cons of this strategy and whether it’s right for you, but definitely give it some thought. NOW, more than EVER, hire an expert. The membership roster of the Toronto Real Estate board has swelled in past years. Obtaining a real estate license has been hobby for many and there are way more part-time agents than you know of. Every year, we deal with dozens of these agents and it is great to negotiate against them, because we always win – but you don’t want to be the one they are representing. There are also many great agents out there – hire one of them! Hire an agent that has their finger on the pulse of your neighbourhood. Hire an agent who has been selling for long enough to develop great relationships with all the top agents in your neighbourhood. Hire an agent who has sold in a market like the one we are in right now. Hire an agent who has a strategy outside of putting your home on MLS. You get the point – hire one of the good ones! Our family has been selling 28 years – did you know that nearly 90% of the agents in Toronto have been practicing less than 25 years? Don’t assume this is the new norm. What a great feeling – you get to buy a house and NEGOTIATE the price DOWN! That said, don’t get too cocky. We had a client in 2008, when there was a 6 month pause in the market, who kept low-balling sellers. No one was willing to sell to him and he ended up losing his wife’s dream home over $6k. It (most likely his wife’s wrath) literally brought him to tears and prices began to rise shortly there after. Be picky, but not too picky. There are more homes available, so take your time and find the right one. Don’t be unrealistic and look for a property that will never present itself because you will miss this current opportunity. But, definitely think of what you really want and look for it. Don’t sit on your hands. In the long run, real estate always appreciates. There are ups & downs along the way, but the trajectory is up over time. We just witnessed the former and are in the middle of experiencing the later. If you are in a position to take advantage of a down market, do it – strategically. Create an intimate relationship with your mortgage broker. Honestly. When you are buying a property, you, your Realtor and your mortgage broker need to be BFFs. The landscape of the mortgage world is fluid and just because you got a pre-approval 2 months ago doesn’t mean that you are fully OK to buy right now. Make sure to have EVERYTHING your mortgage broker asks for now and give it to them ASAP. We are hearing of a lot of hiccups on closing and we don’t want our clients to be experiencing that first hand. Consider renting your current property. If we are in a market dip, and if the market will always go up in the long-run, doesn’t it make sense to buy low but not sell low? Now, not everyone can or wants to own multiple properties, and be a landlord, but if you are up for it – definitely consider holding onto your current property while buying your next. Geoffrey owns a triplex and is on the hunt for another rental property right now. If you want to discuss the inner workings of investing in multi-family homes, make sure to reach out! NOW, more than EVER, hire the right agent. Work with an agent that that has helped other buyers through a market where they were able to negotiate. Seriously – a HUGE percentage of buying agents out there right now have only known how to tell their clients to pay more than everyone else. The skill/art of negotiation is not as strong in most agents as you would hope. Hire someone that cares about you and not only wants to help you get a deal but knows how to make it a reality. It is official, our run of rock bottom interest rates is over. This morning, the Bank of Canada was the first Group of Seven country to join the United States in raising interest rates. 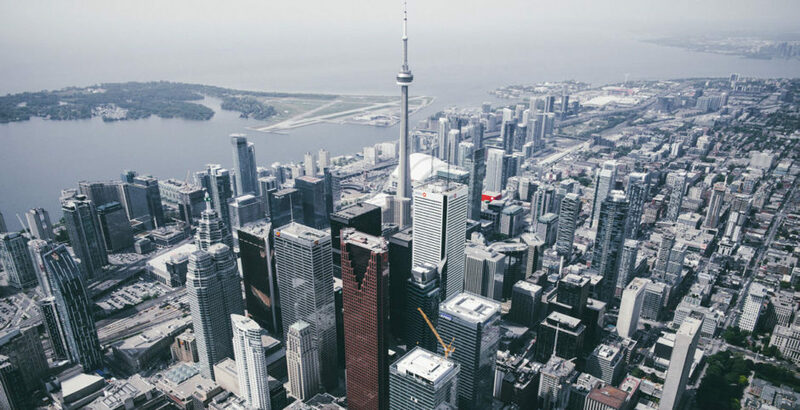 There are many great articles covering the economics of why now was the time for the Bank of Canada to make this move, but we are more interested in what it will mean for the Toronto housing market. First of all, the knee-jerk reaction for most is to panic because all of our mortgage payments will increase. We turned to respected mortgage broker Jason Georgopoulos with Dominion Lending for some real answers. First off, Jason points out that 80% of his clients are in fixed rate mortgages – which means that, despite the increase in variable rate mortgages, their payments will not change. For the 20% of clients who are in variable rate mortgages, many of those mortgages are set up with fixed payments – meaning that while more of the monthly payment will be applied towards the interest amount but the monthly amount the homeowner pays the lender will remain the same. So, it appears that it is a small percentage of the market that will actually see a change to their monthly payments. That said, this is a great opportunity for homeowners to realize that it will cost more to own a home moving forward. When their fixed mortgages renew, they will be renewing at the new mortgage rates – which will be higher than before. And for those in a variable rate mortgage where more of their monthly payment will be applied to interest, the time required to pay down the principle will increase. But, there is no question that people looking to buy a property are in for higher rates and higher mortgage payments. This will affect how much they can borrow. In the past, when borrowing rules tightened (like when the new stress test was applied) we heard many people say that because their purchase approval moved from $600k to $550k, home prices would need to drop accordingly. In reality, buyers had to face the fact that home prices weren’t going to change but their expectations would. This all sounds very rational, but remember our point above about perception and reality. This is the third blow to the Toronto housing market inside of 90 days and that may just be the third strike buyers were looking for. Only time will tell! If you are wondering what all of this means to YOU, fill out the contact form to the right and one of our experienced & knowledgeable Realtors will be glad to talk through your situation with you.